Forrester predicts that by 2021, U.S. digital marketing spend will increase to $121 billion nationally, 46% of all total advertising spending. Entering the digital marketing space is key to reaching customers where they are making purchase decisions and considering their buying options; according to eMarketer, users spend on average 5.9 hours a day on digital media. Digital marketing is even more essential for small and mid-sized companies—while big companies can leverage well-known brands and word of mouth, digital marketing allows smaller businesses to specifically target relevant audiences and reach specific groups of customers. But because it takes place in crowded online marketplaces, filled with brands competing for your attention, it can be difficult to know where to invest your company’s time and money. According to HubSpot, only 61% of organizations believe their marketing strategy is effective. Understanding the basics of digital marketing allows your business to start testing a range of cost-effective and flexible assets, and to determine what works best for your goals. Digital marketing is a broad term that includes assets or tactics used to market your products or services online. This includes all advertising used to reach with your target audiences on digital channels, for example, search engines, social media, email, and your website. While traditional media makes it difficult to measure the success of your ad campaigns—there’s no way to determine how many people actually read your ad in the newspaper—digital marketing allows you to measure your ROI in real time and make informed decisions based on quantifiable results. Digital strategy is a plan that outlines your digital marketing goals, what you’ll do to achieve them, and how to measure success. Do you want to build brand awareness? Reach new prospective customers and generate leads? Encourage existing customers to try a new service? Clear goals and specific metrics for success create a guiding principle for the mix of digital marketing assets you choose. Content marketing offers value by using content like blogposts, white papers, emails, or social media posts to reach and connect with your target audience. Whether educational, inspirational or entertaining, content marketing provides relevant information to your target audience, and makes it less likely that potential customers will scroll past. 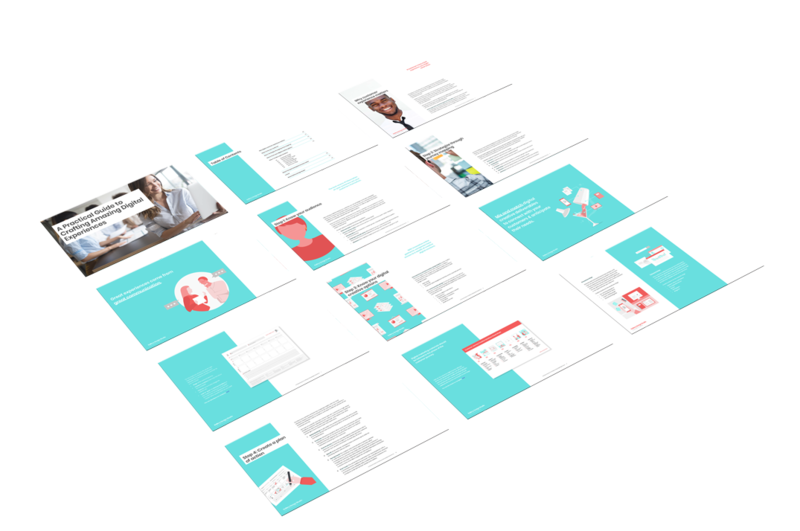 Offering content like infographics, interactive graphs or eBooks can help you generate leads and give users the confidence to make purchase designs. Inbound marketing uses digital platforms to draw customers in and invite them to engage further with your company. In contrast to outbound tactics, which take a scattershot approach to put ads in front of as many eyes as possible, inbound marketing focuses on identifying “qualified” audiences—people who are most likely to be interested in your products or services. 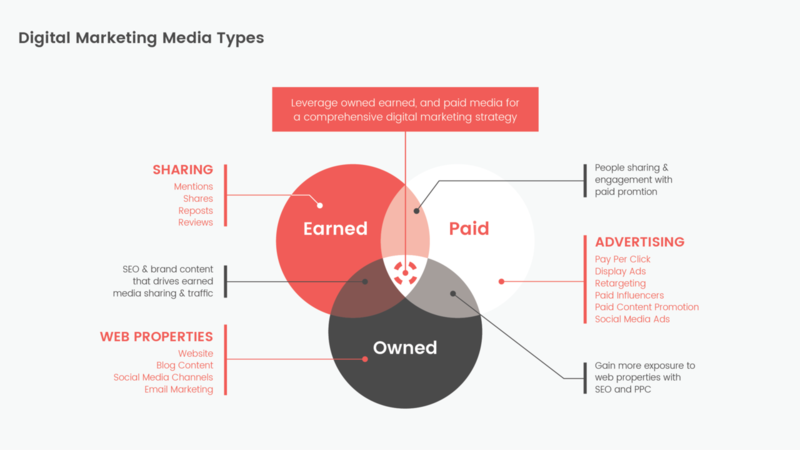 Digital marketing assets fall into three main categories: owned, paid, and earned media. 1. Owned media refers to channels controlled by the brand, whether that means your website, blog, or social media accounts. An appealing, intuitive website encourages viewers to stay on the page and gives them opportunities to engage with your company—this could be through a link to subscribe to your email list or a visual carousel of recent projects. Compelling, uncluttered UX design makes it easy for your target audience to find and engage with the content that interests them. Social media marketing offers valuable content to the viewer—by making them laugh or teaching them something new—to build a genuine emotional connection with your brand. According to Sprout Social, 74% of consumers use social media to help make purchase decisions; many of your potential customers will use your social channels to research your services before buying. A consistent online presence can cement what sets your company apart from the competition. To transform leads into customers, email marketing is a valuable tool to share content and encourage sales. Engaging emails and newsletters have a clear, relevant objective—to offer an exclusive discount, or promote current product offerings. Uncluttered, visually appealing emails can strategically reinforce your brand and encourage buyer behavior. 2. Paid media are paid forms of advertising that allow you to use outside digital channels to connect with new audiences. Search Engine Optimization (SEO) use keywords and best practices in order to “rank” higher on the search engine results page, where you’re more likely to get more traffic from customers who are looking for products/services related to your core business. With a website that is relevant, easy to navigate, and credible, your website will appear higher in Google search results for more free traffic. Partnering with a UX/UI design expert can help navigate the technical set-up and site architecture for an elegantly designed website and enhanced SEO. Paid search ads, or pay-per-click advertising, is another method of driving traffic to your website. Publishers like Google AdWords place your “sponsored result” near the top of the search engine results page, and advertisers pay each time their ad is clicked. Paid search allows you to target your ads to certain keywords and search terms, so your ads only appear to relevant audiences. Ad servers offer display advertising that customize when and where your ads appear based on a user’s recent search history to reach the most relevant audiences. Display advertising allows you to incorporate graphics and interactive elements to grab your viewer’s attention. Native advertising is content-driven and appears on platforms like Buzzfeed next to other, non-paid content. Sponsored social posts work similarly, and blend into the users’ newsfeed next to other non-advertising content. When you’ve developed visually engaging branded content, sponsored posts allow you to reach new audiences and leverage the digital channels where your dream customers live. 3. Earned media is organic publicity, spread by word of mouth as users share or start conversations with the content you’ve created. Engaging content marketing encourages users to become brand advocates and increases your reach to include new potential customers. Digital marketing rests on a clear understanding of your brand and the unique value you offer to customers. What does your business give that separates you from your competition? What problems do you solve for your customers? With a clear understanding of your brand and your target audience, you can set measurable goals and create a digital marketing strategy for success.